Today is the second day of this year's London Open House, and again hundreds of properties around town which wouldn't usually be are open to the public. 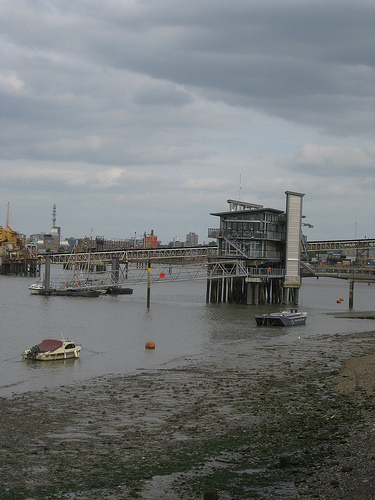 The one that caught your author's eye today is Greenwich Yacht Club. Designed by Frankl & Luty Ltd and completed in 2000, the clubhouse is built over the Thames about half way between the Millennium Dome and the Thames Barrier. It is open for regular architect-led tours today from 1pm until 4pm, with an annual art show, club members available for a chat and spectacular views over the Thames. Visitors can also, we are told, access the sail loft and boat yard.